In 1989, Stan Ridgway released his second solo album 'Mosquitos'. The album is notable for the three tracks featuring Tori Amos pre-'Little earthquakes' and so has become sought after by Tori Amos fans. 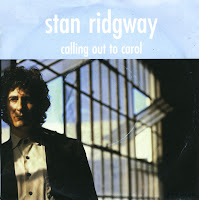 But perhaps the album is even better known for the hit single 'Calling out to Carol', a rather radio-friendly track which reached number 19 in the Dutch Top 40. 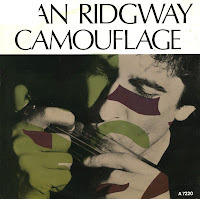 Stan Ridgway was born on April 5, 1954. In 1977 he joined the band Wall of Voodoo, until 1983. After a live concert at the US Festival on May 28, 1983 he and two other members left the band. In 1986, Stan Ridgway released his first solo album, 'The big heat'. The song 'Camouflage' was taken from the album and became a Europe-wide hit. In the UK, 'Camouflage' reached number 4; in the Dutch Top 40 it got to number 14. While the world was waiting for a new album by The Police, the members of the group went their own way to do solo projects. Sting recorded a solo single, and drummer Stewart Copeland recorded the soundtrack for the movie 'Rumblefish', which was directed, produced and co-written by Francis Ford Coppola. As Coppola started to work on the soundtrack of the movie, he envisioned a mainly percussive soundtrack to symbolize the idea of time running out. He asked Copeland to improvise a rhythm track. Coppola soon realized that Copeland was a far superior composer and let him take over. 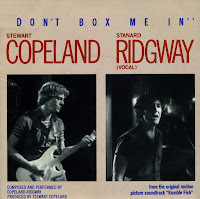 The song 'Don't Box Me In' was a collaboration between Copeland and singer/songwriter Stan Ridgway, leader and frontman of the band Wall of Voodoo.